World Read Aloud Day 2018 was hosted in various venues on the continent on February 1, 2018. In Kenya, the official event was at the KAG Grounds, Nairobi while in South Africa it was at the Mofolo Park, Soweto. World Read Aloud Day, an initiative that aims at ensuring that we have a reading planet, was started by the Pam Allyn founded LitWorld organisation. On World Read Aloud Day first hosted in 2010, people all around the world read aloud together and share stories to advocate for literacy as a human right that belongs to all people. This year, the day was celebrated around the world on February 1. In Kenya, the day was being promoted by LitWorld Nairobi, the local version of the international organisation, and friends of the organisation. 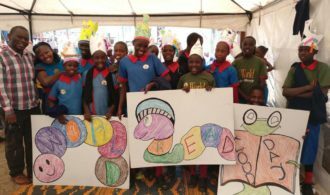 This isn’t the first time that the event has been hosted in Kenya with the organisation from 2015 taking the route of children coming together for an event of reading together. On the day before, they had a warm up event at Joseph Kangethe Primary School followed by the official event on February 1 hosted at the KAG grounds with pupils from 6 local schools participating. This was with a variety of adults like teachers, parents and others. Also reading alongside the kids was Wangari The Storyteller from We’re Going on a Bear Hunt by Michael Rosen. In South Africa, the official event was hosted in Mofolo Park, Soweto with Orlando Pirates in attendance and author Zukiswa Wanner reading from her story The Last Minute. This children’s story is about “a football-loving future Bafana Bafana player and his best friend who hope to lead South Africa to winning the World Cup championship”. Please find here images from the activities from the two days courtesy of the event organisers. Kids at World Read Aloud Day 2018 Kenya. Wangari The Storyteller reads to kids at World Read Aloud Day 2018 Kenya. Orlando Pirates at World Read Aloud Day 2018 South Africa. Zukiswa Wanner at World Read Aloud Day 2018 South Africa. School kids at Mofolo Park, Soweto during World Read Aloud Day 2018. Next Next post: Nigerian poetry legend JP Clark launches new poetry collection.